Narrow, cobblestone paths in the neighborhood of Kadikoy, Istanbul make for interesting pedestrian thoroughfares, but many design changes will need to be made to create a vibrant bicycle culture. Photo by Andy Carvin/Flickr. 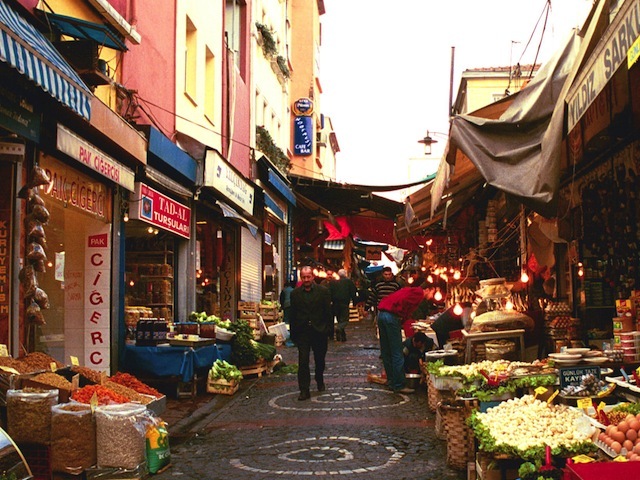 Walking along Moda Cadesi in the Kadiköy neighborhood of Istanbul is an exciting experience. The street is connected to stores, a public park, and a pedestrian plaza that allows all ages and demographics to mix together in a dynamic hub of activity. The city government has worked hard to improve the streetscape in this area, providing continuous sidewalks protected from street vehicles by bollards, ramps at every intersection, and tactile strips to help people with limited mobility. The authorities also implemented a 1.2 km (.75 mile) bike path, which is now frequented by baby strollers, carts, parked vehicles, and pedestrians. Although the Kadiköy municipality has made great strides in creating a pedestrian friendly corridor, there are still several opportunities to improve the streetscape so that both bicyclists and pedestrians can better utilize the space. Walking is more common in Istanbul than many other cities, with 49.3 % of trips currently conducted on foot. The Istanbul Government should be applauded for its work in developing unique, vibrant pedestrian thoroughfares. However, bicycle trips are not even reported. It is not hard to see why there are such low rates of cycling in Istanbul. Bicyclists have a hard time navigating the paths of Kadikoy, Istanbul. Although the thoroughfare presents a vibrant hub for pedestrians, there are many impediments for bike travelers. Photo by Dario Hidalgo/EMBARQ. First, Istanbul in general is very hilly. Bikers might need to buy electric-assisted bikes, which makes cycling a more expensive mode of transport than in other cities. It might also be necessary for the city to create assisted ramps – like a sky rope for bikes – to help cyclists. This infrastructure will in turn demand financial investments. 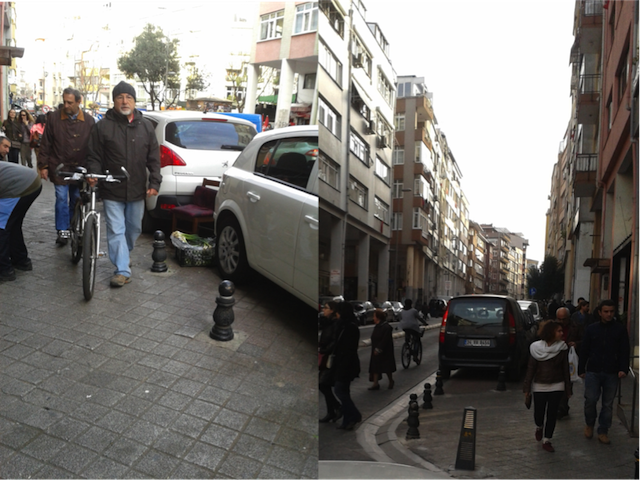 Regarding the particular facility (Moda Cadesi) visited in Kadiköy, there are several ergonomic features that makes bicycling difficult there: street surfaces are made of uneven cobblestones, bollards are placed at every ramp, lampposts rise up in the middle of paths, potholes and narrow sections are inconvenient and often dangerous. Aside from permanent obstructions, there are also multiple parked scooters and motorcycles, street vendors, trash cans, and a constant press of people on the path. Finally, there is simply no culture of cycling for transport purposes in Kadiköy (and Istanbul in general). Biking is still considered a recreation, and bicycles are considered sport vehicles. There is not a high density of cyclists that try riding on the Moda Cadesi path, and therefore there is no one actively complaining about potholes or parked vehicles. Changing the attitudes of a city towards a transport option means changing each individual’s daily routine and lifestyle. This may prove to be as hard as changing the physical infrastructure of Kadiköy. The state of Kadiköy’s paths are by no means bad. The municipality has made a concerted effort to increase the foot traffic in the area, and the streets are nowadays teeming with life. However, it is now possible for the municipality to make street life even better by working towards creating vibrant shared spaces where cars, bicycles, and people can all mix together, such as has been implemented in London’s Exhibition Road. EMBARQ Turkey is such options through its BikeLab projects, and finding ways to adapt streetscape concepts to Turkey’s needs. EMBARQ Turkey hopes to continue contributing to efforts in making the city safe and convenient for biking.